I cannot believe that summer vacation is half way over. I have been reminiscing over last year. What went really well and not so well. Last year I had behavior logs that were sent home daily. They worked okay, but there was room for improvement. I took some time and came up with a complete behavior management toolkit. I revised the behavior log to reflect various levels of achievement to try to emphasize the POSITIVE and down play the negative. This is what I came up with. To foster positive behavior I have included reward coupons, motivational bracelets, and “Good Behavior” certificates and/or postcards. PP. 3 - 10 Ice Cream Behavior Clip Chart: It is suggested to print on card stock, cut out, laminate for durability, and then assemble. PP. 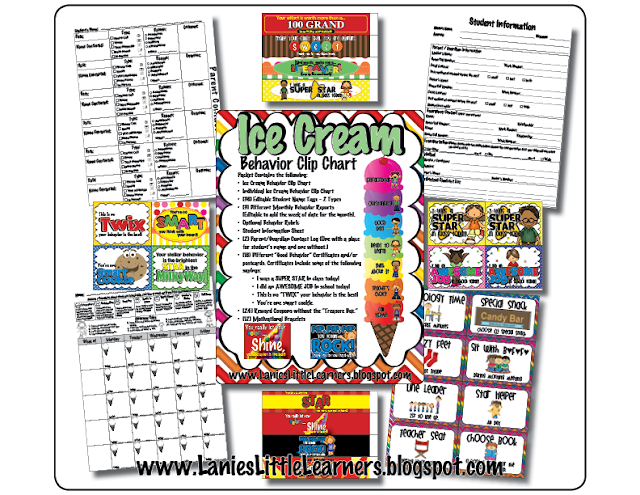 11 Individual Ice Cream Behavior Clip Chart: Instead of making a public display of student’s behavior, use the Individual Ice Cream Behavior Clip Chart. The charts can be placed in the student’s desk, cubby, in a folder, basically anywhere that is out of sight. Simply print on card stock, cut out, and laminates for durability. PP. 12-13 (2) Types of Name Tags: Name tags fit standard size wooden clothespins (dimensions: 0.5 “ H x 0.38 “ W x 3.25 “ L.) Either print on paper and handwrite name on labels OR use Adobe Acrobat to type student names. Trim on the solid black line and use Modge Podge or school glue to attach name tags to clothespins. The second set is numbered. Assign a student a number for his tag. When printing CHOOSE PAGE SCALING - NONE! PP. 14 How Am I Doing? Monthly behavior report with emotional icons. Circle the emotional icon the student received at the end of the day. I send home the behavior report in the student’s communication folder every day. The parents initial on the line each day. At the end of the month I file their behavior report in their assessment folder for future reference. PP. 15 How Am I Doing? Monthly behavior report using color coded ice cream. Look at the top and decide which color the student received at the end of the day and color in the ice cream. PP. 16 How Am I Doing? Monthly behavior report using number coded. Look at the top and decide which number the student received at the end of the day and write the number on the ice cream. PP. 18 Student Information Sheet: I keep the student information sheet, parent / guardian contact log in 3-ring binder tabbed for each student. At the end of the month I place the monthly behavior report in there as well. PP. 26 – 28 Reward Coupons: Decide on how many points or how many days your student is on a certain level before receiving a coupon. Print on card stock, cut out, and laminate for durability to reuse. PP. 29 – 31 Motivational Bracelets: To use as a positive reinforcement for good behavior. Decide on how many points or how many days your student is on a certain level before receiving a motivational bracelet. Print on card stock, laminate for durability, and cut out. This way the students can enjoy the bracelets for an extended period of time.